How do you spell hot? 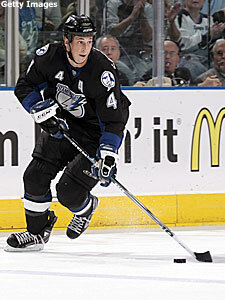 Lecavalier! Vincent Lecavalier has 10 points in his last three games and 21 (seven goals, 14 assists) during the eight-game streak, which has carried him to the top of the NHL scoring race with 34 points. Vincent Lecavalier won the Rocket Richard Trophy as last season’s top goal-scorer. The way he’s playing now, he’s going to add some more hardware to his collection. The Tampa Bay star has been the NHL’s hottest scorer this month, and no one else is close. He had a goal and an assist in Monday’s 4-3 overtime loss to Atlanta, giving him eight consecutive multi-point games. That stretch includes the best individual performance of the season – a three-goal, two-assist night in the Lightning’s 6-1 victory at Carolina Nov. 14. He’s also plus-11 in that span. Lecavalier has 10 points in his last three games and 21 (seven goals, 14 assists) during the eight-game streak, which has carried him to the top of the NHL scoring race with 34 points. Tampa Bay is 5-0-1 in its last six games, and Lecavalier is a big reason for the surge. Todd White -- One reason for the recent surge by Ilya Kovalchuk and Marian Hossa has been the play of White, who has been placed between Atlanta’s two big guns and has them firing on all cylinders. White has six points in his last four games, including a game-winner in OT Monday against Tampa Bay and the setup on Kovalchuk’s game-winner six nights earlier against Florida. Evgeni Nabokov -- San Jose is starting to get on track, and part of the reason is Nabokov’s goaltending. He’s 3-0-1 in his last four games, including a pair of shutouts and a .959 save percentage, in his last four games. Patrick Sharp -- Lost in the attention given to Chicago’s rookie duo of Patrick Kane and Jonathan Toews is the play of Sharp, who has given the Blackhawks an unexpected offensive boost. He already has 10 goals, four of them shorthanded, and had a hat trick in Saturday’s 5-3 victory over Detroit – Chicago’s fourth win in as many games over the Wings. Michal Rozsival -- The New York Rangers picked up Rozsival for nothing in 2005 and have been amply rewarded since. He has three of the Rangers’ last five goals, including the first two short-handed tallies of his career, and leads all defensemen with seven goals. Roberto Luongo -- After a slow start, Luongo is starting to look like the player who finished second in the balloting for the Vezina Trophy last season. He’s 5-0-2 in his last seven games, allowing only 13 goals in that span – and one of the games he didn’t win was a 1-0 shootout loss in which he pitched a shutout through 65 minutes. Dominik Hasek -- “The Dominator” hasn’t been very dominant recently. He’s allowed four goals in back-to-back games, both losses, and is 5-4-1 with a 2.89 goals-against average and a .859 save percentage on one of the NHL’s top teams. Joe Sakic -- The future Hall of Famer’s scoring touch has disappeared during the past few weeks. Though he’s still averaging nearly a point a game, Sakic hasn’t had a goal in his last 10 games and has just one since getting a hat trick against Columbus Oct. 13. Mark Recchi -- Pittsburgh has been in a slump, and Recchi’s lack of production is one reason why. He has just one point (a goal on Nov. 8) in his last 10 games and was scratched for a game last week. Raffi Torres -- Torres is getting plenty of shots on goal – he led the Edmonton Oilers with 66 through 21 games – but they’re not going in. He has no goals since getting two in Phoenix Oct. 18, and hasn’t had a point since a three-assist night against Minnesota Oct. 25. Martin Rucinsky -- The Blues scratched Rucinsky against Nashville Monday, another step down in a season in which several of their veterans have struggled. Rucinsky has just one goal and eight points in 16 games, and has managed just two assists in his last five. Injuries and notes -- Saturday’s game against Detroit was a night of highs and lows for Chicago forward Rene Bourque. The highs: He scored a pair of short-handed goals and added an assist. The lows: He broke his thumb, had to have surgery and will miss 4-6 weeks. … Chicago hopes to get forwards Jason Williams (groin) back this week and Martin Havlat (shoulder injury on opening night) back next week. Other injuries this past week: Calgary’s Marcus Nilson (concussion), is out indefinitely. … New Jersey’s Paul Martin (lower body) has missed two games but could return this week. … Minnesota’s Mikko Koivu (cracked fibula) will miss at least this week. The Wild also are without Pavol Demitra (groin). … San Jose put forward Marcel Goc on IR with back spasms, and Dallas did the same with defenseman Mattias Norstrom (broken orbital bone). Back in the lineup: Washington forward Alexander Semin (ankle) returned Monday and scored against Florida, which got forward Rostislav Olesz (hand surgery in October) back for that game. … Vancouver got defenseman Lukas Krajicek (out for more than three weeks with a fractured ankle) back last Saturday. Also returning last Saturday: Nashville defenseman Shea Weber (dislocated kneecap on opening night); Philadelphia forward Sami Kapanen (missed four games with a knee injury); Boston defenseman Aaron Ward (missed two games with a concussion), and Carolina forward Niclas Wallin (missed nine of 10 games after shoulder surgery). The Hurricanes also got forward Andrew Ladd (ankle) back on Friday, and could get another forward, Erik Cole (neck), back this week. Hoping to get back this week: Anaheim defenseman Mathieu Schneider (two games, hip); Buffalo center Tim Connolly (five games, strained oblique); Columbus center Michael Peca (five games, groin), Vancouver defenseman Sami Salo (broken nose on Nov. 1). … Anaheim forward Todd Bertuzzi, out since early October, has been cleared to resume drills, and Philadelphia defenseman Derian Hatcher (knee surgery) could be back next week. … Edmonton defenseman Joni Pitkanen had an MRI done on his right knee, which was scoped last month. He’s listed as day to day, but the Oilers had hoped to have him back by now. The week ahead -- It’s one of the busiest weekends of the season, with 18 teams playing three games in four nights and a return to some inter-conference matchups. Detroit at Nashville (Nov. 22) -- The Predators have taken to playing at home on the holiday, and Nashville will be looking to atone for a 3-2 shootout loss in Detroit earlier this month. Montreal at Buffalo (Nov. 23) -- For the second-straight Friday, the Canadiens visit the HSBC Arena, this time for the start of a home-and-home series. New Jersey at Tampa Bay (Nov. 24) -- The Devils will try to avenge an opening-night loss to the Lightning. Amazingly, after this game, New Jersey will have completed all six visits to the two Florida teams and Atlanta. Los Angeles at Anaheim (Nov. 25) -- The Ducks swept two games in the newly named “Freeway Faceoff” Nov. 14-16 and are starting to play like the team that won the Cup last spring. Montreal at Toronto (Nov. 27) -- Canada’s longest-running rivalry faces off for the fourth time this season; the road team has won the first three. Chicago -- Part II of their annual November trip is a three-games-in-four-nights swing through Western Canada, beginning Thursday night in Calgary. Dallas -- The Stars finish a homestand Friday, then play three games in four days in the New York City area. New Jersey -- The Devils used to spend Thanksgiving week on the road because of the ice show at the Meadowlands. This year, their new home, the Prudential Center, has basketball and concerts, sending the Devils to Pittsburgh, Atlanta and Tampa Bay in a four-night stretch. San Jose -- The Sharks can enjoy their Thanksgiving turkey: They played last Saturday and have a week off until their next game, then three more days off until they play again next Wednesday, also at home. Florida -- The Panthers spend Thanksgiving Eve in Columbus, host the Rangers two nights later, and then get four days off. Nashville -- The Predators catch something of a holiday lull: Home games with Detroit Thursday and Minnesota Saturday are their only contests in a 10-day stretch.